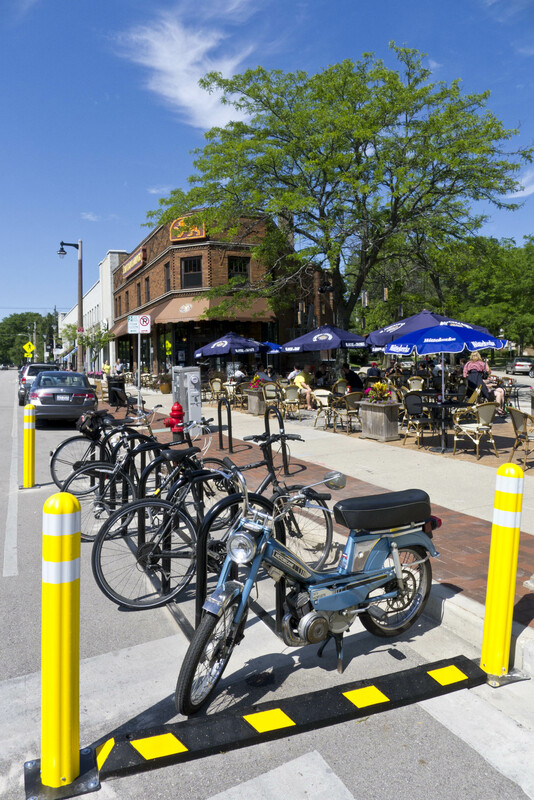 The owners of Cafe Hollander on Downer Avenue installed Milwaukee’s third bike corral today. The first was installed by Alterra Coffee on Propect Ave. The second was installed by the Nomad World Pub on Warren and Brady Streets. So far none of these have taken away any legal parking spaces for cars, but cars used to stop illegally to run in and pick up coffee in the spot where Alterra put in their bike corral. All these racks have been paid for by the owners of the adjoining cafes. It is great that business owners see the value that bicycle parking adds to their bottom line. It is also great that they see bicycles as a more efficient way to get more customers given that automotive parking is so inefficient. This Nice Ride Minnesota kiosk is in the street. Photo by John Hoff from the blog "Adventures of Johnny Northside." 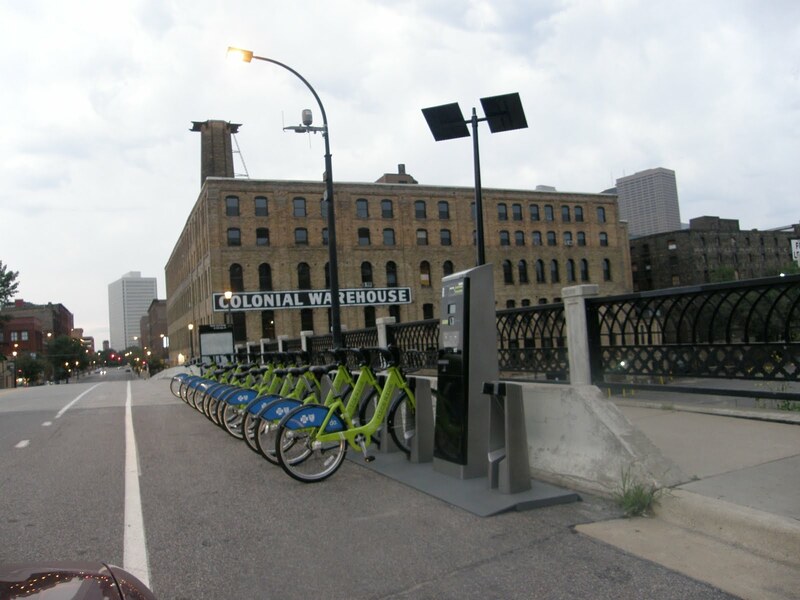 In Minneapolis, Nice Ride Minnesota bikesharing stations are also installed on the street. This makes finding open spaces a lot easier. Typically it is difficult to find empty right of way in the walk area between the curb and the building fronts. Putting the bike parking in the street where the cars park also leaves more open right of way for sidewalk cafes. According to the Ithmus, Madison has plans for two bike corrals to be installed by the end of the month. The Madison bike corrals will be installed in a parking stall in front of the Tipsy Cow on King Street, and another will go in on Harrison Street at Trader Joe’s. Each corral will have a capacity of 10 to 12 seasonal bicycle parking spaces. As soon as those go in, I will have a report and photos here on Over the Bars in Wisconsin. Any bike corrals planned for other areas of the state that I don’t know about? LaCrosse? Eau Claire? Wausau? Green Bay? Let me know via comments below if there are. I like that concept Troy. Change the paradigm. Who will be the first business in Bay View to take the lead down here? Wu-who! I knew they planning this, just didn’t know when. Three of the city’s must efficient customer parking spots! I go to Trader Joe’s once a week in Madison and the bike racks they have are always full, not counting the bikes stacked up on the railing by the stairwell. This one is much needed. The one on King Street is right off the spare so no doubt it will also be well used. I wonder what seasonal means? Alan, to your question about what “seasonal” means (at least as it relates to Milwaukee’s bike corrals)… The City has agreed to permit the corrals in the right-of-way from March 1 through November 15. The corrals will be taken down for the 3 1/2 months of harshest winter conditions. The opportunity is there though to potentially leave them up year-round to promote 365-day bike riding. The decision to petition for this has yet to be made. In the meantime, I’m always curious to hear where others see a bike-corral demand in Milwaukee. Thoughts?